I have really enjoyed working on cards lately and I wanted to share a couple that I have made in the last little bit. Both of them were sent to message board friends of mine in Australia for their birthdays. 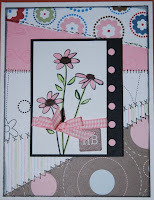 This one was stamped with some of my Stampin' Up stamps. This card is really pretty. I couldn't see it too clearly...but did you actually stitch the paper together with a sewing machine?